Antifa activists and others clash with supporters of President Trump at a pro-Trump rally near Independence Mall in March. In January, on the evening of President Trump's inauguration, a band of bandanna-wearing vandals raced along South Street, shattering the windows of two banks and a dozen storefronts. "They came by and had masks on," recalled Tanya Italia, manager of a high-end furniture store. "They just smashed the window with a hammer. It was just a day of vandalism. I don't think of them as real protesters." The next month, an evening protest march along Broad Street turned ugly at Temple University. Some anti-Trump demonstrators tossed latex gloves filled with dye at Philadelphia police and campus officers, the university said. In May, police said up to 50 masked and black-clad men and women sprinted through a changing section of North Philadelphia, smashing windows in renovated buildings and more expensive cars and throwing Christmas ornaments filled with paint. They carried a banner that read: "Gentrification is death and revolt is life." These outbursts reflect the Philadelphia presence of antifa and its allies, a shadowy collection of extreme left-wing activists who, in their most controversial manifestations, have embraced property damage and street brawling as legitimate forms of protest. Their advocates insist that the group acts primarily as a defensive force, but also say a growing threat of homegrown fascism justifies an aggressive punch or the outright silencing of hateful speech. While the group has been a simmering, if tiny, political factor for some years now, Trump gave it a massive boost when he decried antifa's role in the violent protest in Charlottesville, Va., two weekends ago. "They show up in the helmets and the black masks and they've got clubs — they've got everything," he said last week in Phoenix. "Antifa!" To some in Charlottesville, antifa, short for anti-fascist, was a life-saver – forming a defensive perimeter that sheltered pastors and rabbis from the blows of white supremacists. At the same time, video and photos showed leftists and rightists mixing it up with blows, pepper spray and sticks. While the right is united in denouncing the group, it presents a thornier puzzle for the left: Are its adherents useful in checking the most ugly tendencies of the far right, or are they an authoritarian bloc whose violence and nihilist street theater is a gift to Trump? Daryle Lamont Jenkins, a Philadelphia-based veteran of the anti-fascist movement, said public opinion means little to antifa. "We're not trying to fight a public relations war. It's about defending people," Jenkins, 48, said. "Let's face it: Antifa doesn't even talk to the media very much. They don't care about public relations." Antifa is especially strong in Philadelphia, a reflection of the city's vibrant youth culture. Its supporters overlap with and mix with other young anti-Trump activists who endorse a variety of strongly leftist views. A masked, black-clad Antifa supporter waves the groups red-and-black flag at 11th and Market Streets in Center City in protest of a visit to Philadelphia by President Trump. George Ciccariello-Maher, an antifa supporter and professor of politics at Drexel University, agreed to explain a movement he views favorably. In doing so, he has adopted a somewhat rare role in a movement whose supporters often eschew personal publicity or promoting identifiable leaders. "The antifa orientation begins with recognizing that Nazism and fascism is a threat, a real threat," Ciccariello-Maher said. "The question is, how do you confront it? What are the limits of that tolerance, and what are the means of shutting it down?" Last Christmas, the tenured Ciccariello-Maher was chastised by Drexel after he posted a tweet, "All I want for Christmas is white genocide," a satirical jibe at a neo-Nazi belief that white people face possible extermination. Since, he has criticized Drexel for its attack on his "free expression." At the same time, Ciccariello-Maher says there are limits to tolerance, and some right-wing speakers should be silenced. "What the Nazis want to do is march. Antifa is saying, you want to march? We're not going to let you do it," he said. "It's an openly confrontational perspective to go on the offensive against Nazis." 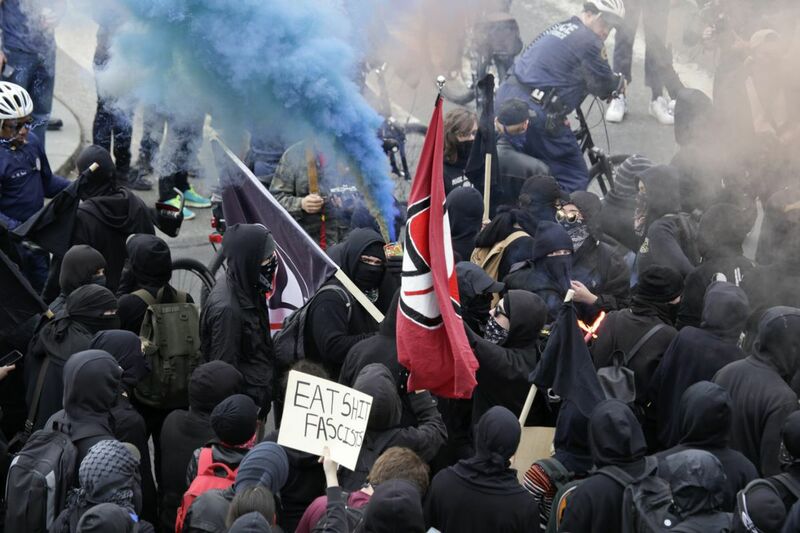 Scholars trace antifa to groups that tangled with the fascists in Europe in the 1920s and 1930s. But its contemporary manifestation has more to do with punk music than the Weimar republic. When skinhead neo-Nazis began to surface in the punk scene in Britain, other punk rockers rose up to oppose them, often with fists. In time, this kind of resistance flared in the United States, in West Coast cities such as Portland and Seattle, and in East Coast ones such as New York and Philadelphia. With its influx of millennials attracted by cheap rents, its punk music scene, and its long-time smattering of anarchist collectives along Baltimore Avenue in West Philadelphia, Philadelphia was a natural incubator for the movement. Four years ago, well before the ascendancy of Donald Trump, the city's local antifa chapter was one of the first to align with a national parent group. Two years ago, the local chapter hosted the second national annual convention of antifa groups at the Rotunda, an auditorium at 40th and Walnut Streets. When the Philadelphia chapter joined the movement, it agreed to several "points of unity" required by the national organization. The key point: The common goal was to "disrupt fascist and far-right organizing and activity." In another "point of unity," the organization said: "We don't rely on the cops to do our work for us." At this point, the local movement likely numbers no more than about 200 participants, if that, a band of activists that has surfaced in a series of short and brutish encounters — swinging at far-rightists and white supremacists, among others, but also at police. In March and again in July, antifa members and pro-Trump demonstrators clashed in Center City. Authorities arrested six antifa protesters, all men ranging in age from 19 to 40. Leftist activists attend a spring protest in Philadelphia. In an interview, Howard Caplan, 48, a Trump supporter seriously injured in the July incidents, insisted he was no fascist. "Because I support the president of the United States, they think I'm a white supremacist," said Caplan, who said he favored Bernie Sanders in the presidential primary, then shifted his support to Trump. Over the last year, Caplan has achieved some local notoriety for standing on Roosevelt Boulevard with a "Hillary 4 Prison" sign and for disrupting a mass at the Cathedral Basilica of SS. Peter and Paul with shouts about the debunked "Pizzagate" child-abuse allegations. On July 2, he said, he was headed towards Suburban Station carrying a "Trump 2020" placard when he was encircled by young men whom he identified as supporters of antifa. "This kid comes up out of nowhere, and he's like, 'Hey, man, what's on your sign?'" Caplan said. Before he could answer, Caplan said, he was struck with a bottle, then kicked and punched. He was taken to Hahnemann University Hospital, where doctors treated him for a head injury that required six staples to close. Three people were arrested. Howard Caplan in the hospital shortly after he was attacked in Center City. He blamed the assault on antifa supporters. "I know their methods," Caplan said. "They're just trying to stir everything up. The media has portrayed them as counterprotesters, but they have an agenda. The agenda is anarchy. They're there to create chaos." Philadelphia police Deputy Commissioner Dennis Wilson, who commands civil affairs and Homeland Security, says his officers see antifa members as nebulous figures who slip in and out of groups of other protesters, at times shedding their masks and black outfits to fit in. Over time, he said, police have become skilled at keeping angry leftists apart from their right-wing counterparts, with officers sometimes darting on bikes into protest ranks to create barriers on the fly. "You don't let two fighting groups come together," he said. "We separate them." Even Jenkins, the Philadelphia activist sympathetic to antifa, objects to property destruction and aggressive attacks. "When things get physically violent, it should always be in the context of self -defense," he said. "Yes, I am aware that there are times when it's not self -defense. When it comes to that, I just say there are times when people have just lost it."